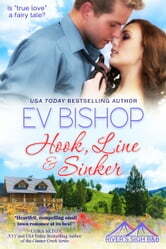 Hook, Line & Sinker is an awesome story! I could not put it down. I do not normally read stories about abused women but this one just pulled me in because Katelyn was such a fighter to get herself and her children to safety. (There are no gruesome details, she is fleeing when the story begins.) This book has vivid characters and a well thought out plot. I would like to visit River's Sigh for a long relaxing vacation. I highly recommend that you read Hook, Line & Sinker.